If you've ever wondered what it would be like to see a bunch of happy, well-off festival-goers basking on blankets and enjoying wine and cheese while taking in life affirming lines such as "If you could save me from the ranks of the freaks who suspect they could never love anyone," you're in luck. Celebrated singer-songwriter Aimee Mann is coming to Highland Park's Ravinia Festival on Sunday, August 31, to promote her forthcoming seventh solo studio album, @%&! Smilers. Classic British pop band Squeeze is sharing the bill. 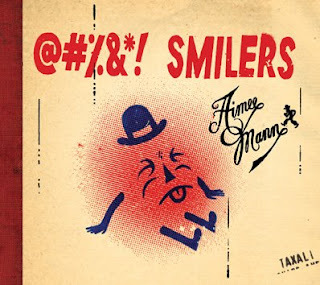 Smilers, out June 3rd, sounds very much like what you'd expect from an Aimee Mann record. It's clever, melodic and lyrically not very happy, while at the same time managing not to be a total downer and maintaining a high level of accessibility. Mann completely ditches electric guitars for this record. She also ditches the concept album approach of her last collection of originals, 2005's The Forgotten Arm, opting for 13 tunes that each tell a unique story. The album kicks off with the first single, Freeway. This is another of Mann's frequent character studies of those who are anything but all smiles, with plenty of memorable lines such as "You found yourself a prophet, but you left him on the boardwalk/Another chocolate Easter bunny hollowed out by your talk." Only this one features a synth line that would make The Cars envious. Mann continues her new-found synth fixation (or a return to her roots, considering her 'Til Tuesday records) on Thirty One Today, which musically sounds happy, but lyrically deals with feelings of depression that result from its protagonist getting older and feeling as though he or she hasn't accomplished enough, leading to introspective afternoons of "getting loaded watching CNN." Fans who favor Mann's more organic sound will also find much to love on Smilers, most noticeably on the thoughtful, sadly beautiful Medicine Wheel and Columbus Ave. Elsewhere, Little Tornado is a haunting track that personifies the title object and its destruction - "bane of the trailer park" - while Stranger into Starman is a brief reflection sparked by a crossword puzzle and an Anne Sexton poem. Another highlight, It's Over, is a soulful ballad that soars with an orchestrated sound and one of the album's strongest melodies. Album closer Ballantines, with its quirky ragtime vibe and happy-go-lucky delivery, is reminiscent of Way Back When from Mann's debut solo record, Whatever. Like its cartoon cover star, @%&! Smilers is simultaneously sour and whimsical, full of life in a down sort of way. What more could you want from an Aimee Mann album?